George has been a fixture in our yard since we moved in. He was one of the first cats I spied out back, roosting on a fallen fence. When we TNR'd him along with several other ferals, he grew close to Mugsy, the charismatic orange tabby whose personality came to define our little colony. They were inseparable, so when Mugsy was hit by a car last summer, we feared George would be lonely. 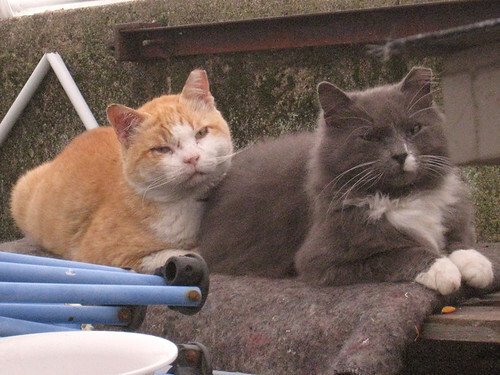 But cats aren't sentimental; George soon struck up a friendship with Blue, another of the yard's regulars. Blue himself had lost his confidante, Edmund, the previous spring, who had died of old age. George and Blue spent most of their time together, and when we took on a whole new colony of young cats, became the grandfathers of the colony. 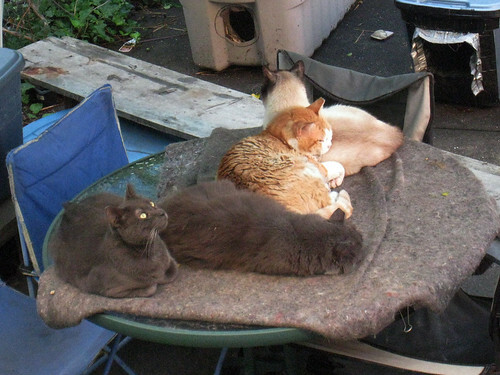 They shared a big shelter and spent their days lounging on a cat bed protected from the elements. Even though they were both at least 6 or 7, I expected them to live many more years. Sadly this wasn't the way it worked out. Friday I came outside, noting what appeared to be a ragged piece of fabric in the snow on top of the plywood that covers the shelter area. When I looked closer I realized it was the matted fur of George. He was frozen solid and surrounded by blood. I had to pour hot water around his body to get him out of the ice; later I had to pour hot water around the plywood to get rid of the blood splashed onto the snow. I don't know what happened to him. Something got him and tore him up. I thought maybe the fight had happened elsewhere and he dragged himself back home to die, but there was no blood anywhere else in the yard. Whatever happened, happened here. The rest of the colony had been scared by the incident and most were hiding in a nearby abandoned house. It took a few days for them all to come back and be counted, but one was still missing: Blue. There has been no sign of him since Thursday night. I am not optimistic I will see him again. 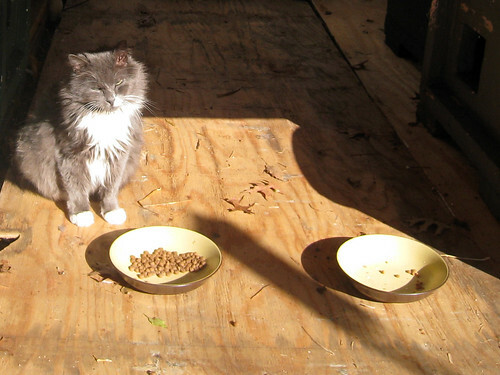 Blue was a gentle, fat cat, who liked to keep his food bowl in plain sight at all times. He is not one to run off and not come back, so I can only assume that whatever got George also got Blue. But what could do this to a cat? Out best guess is a raccoon. We know they live near and often come by in the summer to see if there's any leftover cat food. There have never been any serious incidents between cat and raccoon populations, but perhaps the raccoon was starving, rabid, or in the midst of a mating season frenzy. Other theories include coyotes or possibly even humans. I don't really think a person could have done this, but only because I think George was far too wary of people to be caught. As familiar as I was to him, he still ran when I came out to feed him, and he has been too smart to trap since we first caught him 2008. I can certainly imagine a person doing this just because they hate cats and hate people who don't hate cats, but I think George would have outsmarted someone like that. If Blue doesn't turn up soon, it means our entire original feral colony is effectively gone. Several of that first round of TNR cats have been turned into house cats (Augie, Tuxedo), and the others are now dead (George, Mugsy) or disappeared (Baxter, Blue). 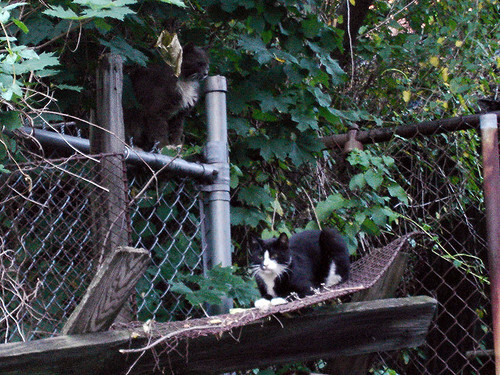 Of course there are now many more cats that have become a part of our colony, but there was something special about that original bunch, they learned how to be TNR cats just as we were learning how to be TNR people. I'll update this post if we ever find Blue or what really happened. UPDATE: Last night, Blue showed up, apparently no worse for the wear. He seemed a little skittish but then, he is a feral and I was shoving a camera in his face. He's now the old-timer of the colony, I hope he finds a new pal among the young folk. But for now, I just want to memorialize George, the longhaired gray tuxedo cat. He always looked grouchy but was actually very playful. He and Mugsy were a good team; he groomed Mugsy constantly, eventually catching the same ear condition that gave Mugsy his tilted head look (we eventually got Mugsy's ear fixed and had still planned to get George fixed up as well). George also had friendships with Jumbee and of course Blue. Apparently he had a thing for other gray cats. We can never know his full story but we are glad we got to spend some time with him; it should have been a lot longer. Some photos are below, here's his full album. 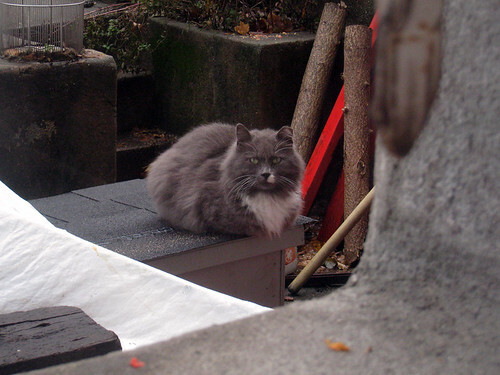 This entry was written by Jimmy Legs, posted on January 18, 2011 at 11:17 am, filed under Bad Stuff, Cats, Feral and tagged Blue, Cats, Feral, George, gray, longhair, memorial, RIP, TNR. Bookmark the permalink. Follow any comments here with the RSS feed for this post. Both comments and trackbacks are currently closed. Oh Chris, I'm so sorry. Thank you for taking such good care of George and all his friends. He would have been gone long ago if it weren't for the care he received from you. Oh my god. Whatever happened, I hope it was quick. That is so sad about George. Mugsy and George have hopefully found each other again. It is wonderful news though, that Blue has turned up, apparently unharmed and doing okay. All of the cats you look out for are so lucky to have you and your wife taking such good care of them. Thank you for all you do. This was so sad to read! Poor George. He was such a beautiful cat. Aw, I feel terrible for the ending George met this week. I agree with the previous comments that at least he was lucky enough in life to spend a great deal of time safe and happy under your care. I still very much miss your Mugsy postings, and now I will be missing George as well. I sincerely hope the rest of 2011 holds good things for you and your wife and the rest of the colony under your care. Events like these are heartbreaking, but the good you are doing means so much and is a wonderful example for how to have respect for less fortunate animals. I just happened on your site … and fell in love your cat family. Thank you for sharing! So sorry about the loss of George, and the manner in which it happened. It's a hard life for our ferals, but you've made their existence a happier one. What a handsome lad George was, this is a good memorial for him (and for Mugsy) the videos of them are beautiful. True friends. Mr & Mrs Jimmy Legs, you do a great job in looking after these ferals. Long may your colony thrive.